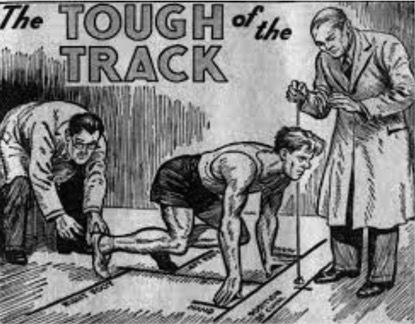 We usually have a coach on for this relatively new venue. Note: There will be a 1 way system in operation around the park. Follow signs and parking marshal’s directions. From South. A1 Join A19 at Seaton Burn interchange. (Signed Tyne Tunnel). Travel South to Moor Farm Roundabout. Take second exit A189. (Signed Ashington). Travel North on A189 then A1068 (The Coastal Route) to Red Row. At Red Row continue on A1068 and Country Park is signposted on right. Post code NE61 5BX. From South. A19. At Moore Farm roundabout, take 5th exit A189 (Signed Ashington). Follow as above. PARKING. Car parking is within the country park using various sites. A charge of £2.00 per vehicle will be collected to cover the fee for holding an event at Druridge Bay, Please follow marshal’s instructions. Be prepared for a walk of over half a mile to the course. It is vital that you car share please – don’t leave home without a full car! REGISTRATION. Will be at the Visitor Centre. There will be portable toilets near the course. A refreshment van will be near the course. 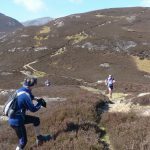 Mud, Wind and Rain – Again! 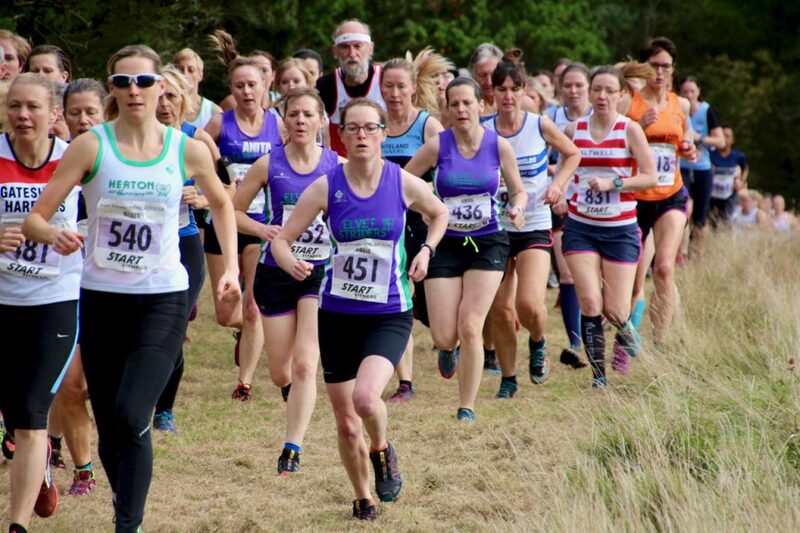 The Harrier League road show moved on to Druridge Bay for the first time on Saturday. Mudwoman and I arrived in good time, with the Striders tent and flag, only to see another club’s tent (identical to ours) flattened by the strong gusty wind. Flags and tents were flapping and leaning alarmingly as we unpacked our faithful shelter. With careful planning and speedy execution the thing was up in quick time without (major) incident and ready for the arrival of the Striders bus. The course was situated within the Druridge Bay nature reserve just behind the coastal dunes. 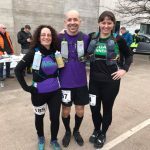 With undulations rather than hills it promised to favour the speedy road runners – if it hadn’t been for the copious amounts of mud, a wind that was gathering in strength and heavy showers that were rattling through every few minutes. 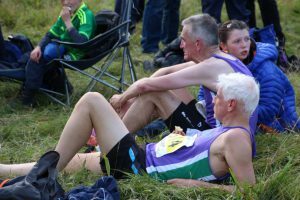 A surprisingly large field, given that Aykley Heads was just a week before, and a Strider turnout of 42 runners promised a competitive race and that’s just what we saw in both the Senior Women’s and Senior Men’s races. 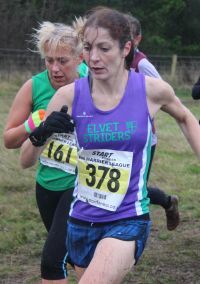 Olivia Neal running for Striders for the first time (but as a non-counter while her ‘transfer’ goes through) had a brilliant run being first Strider home in 18th place and achieving promotion to the medium pack. Well done Olivia! 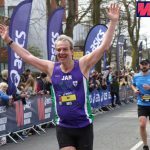 I’m sure this will be the first of many great achievements in the purple vest! 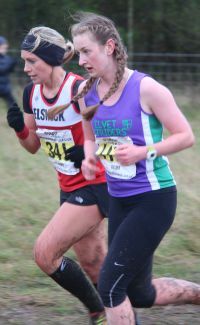 Not far behind Olivia was the experienced Sarah Davies battling through the tough conditions to also achieve medium pack status for the first time. 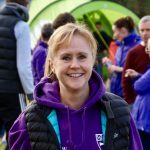 Sarah was followed by the even more experienced Mandy who’s been competing in x/c since she first broke into a run as a toddler. The counters were completed by Elaine Bisson running from the medium pack (excellent!) 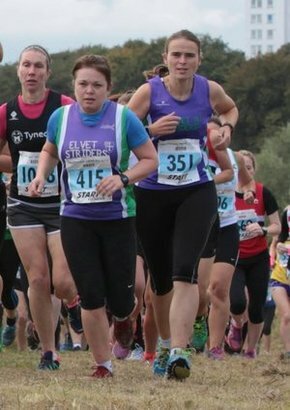 and our international veteran x/c runner Fiona Shenton – a role model for the younger women (and men) in the club. These front running Striderettes were supported as ever by the ‘sea of purple’ putting in some brilliant performances such as Rachelle Mason showing great promise, Lucy Cowton a welcome return and brimming over with enthusiasm, Diane Watson – straight back on board at the earliest opportunity, Jan Ellis showing grit and determination and Jennifer Cowen on her HL debut bravely fighting through the challenging conditions. Well done to you all! An eighth place finish on the day and likewise for the season so far but things are very close and the Striderettes are just one point behind the fifth placed club – so come on, we know you can power up that league table during the second half of the season! The course was at its muddiest for the men’s race but this didn’t put anyone off! 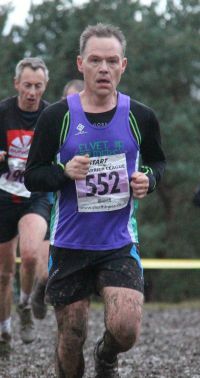 Least of all Simon Gardner who had the x/c race of his life leading the team home and qualifying for the medium pack for the first time. Well done Simon! Rumour has it you were even heard to say you ‘enjoyed it’. 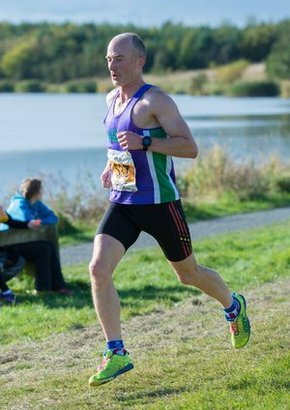 Just a few seconds behind Simon was Mark Warner – Striders’ ‘Flying Dentist’ who in just his second HL also achieved medium pack status – brilliant! 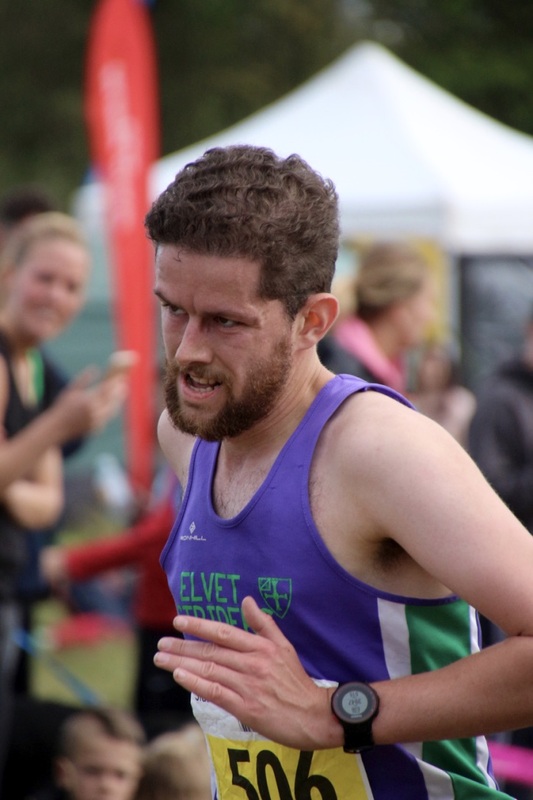 Third counter was the impressive Michael Mason, also running in just his second HL for Striders, Michael just missed emulating Penny’s achievement of last season, of going from slow pack to medium to fast in successive races, by six seconds – an incredible run. 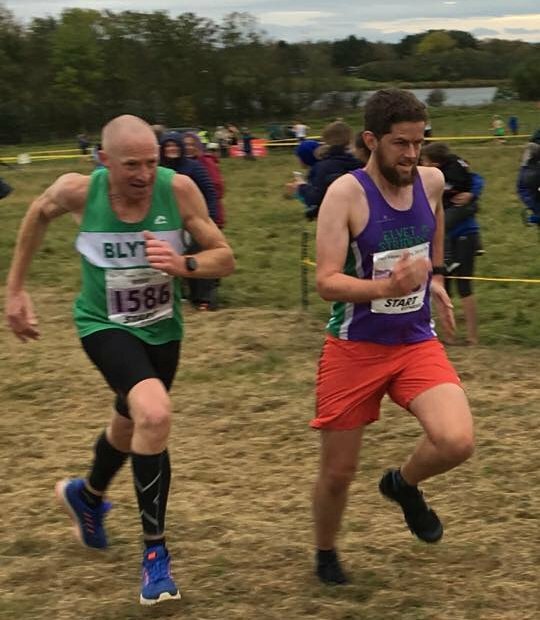 The counters were completed by the ever improving Jack Lee and Matt Archer and finally by ‘Old Tom’ – no not a real ale but a tough, determined & committed runner – well done the lot o’ya! 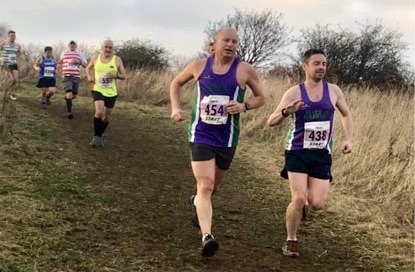 Just as in the women’s race the counters were supported by a team to make the club justly proud including Stephen running from the fast pack (and 500m further than the rest of the field! 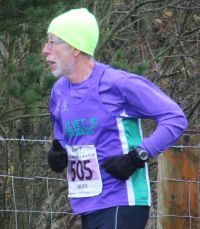 ), Shaun the Sheep back in the fold (pun intended) on a regular basis now, John Hutch – part of the Striders’ furniture grafting once more through the mud, Adam Bent – seeming to enjoy his running far too much, Dave Spence – a very respectable performance from Striders’ ‘senior’ man and Stephen Ellis making it a family day out. Many thanks to you all and well done! 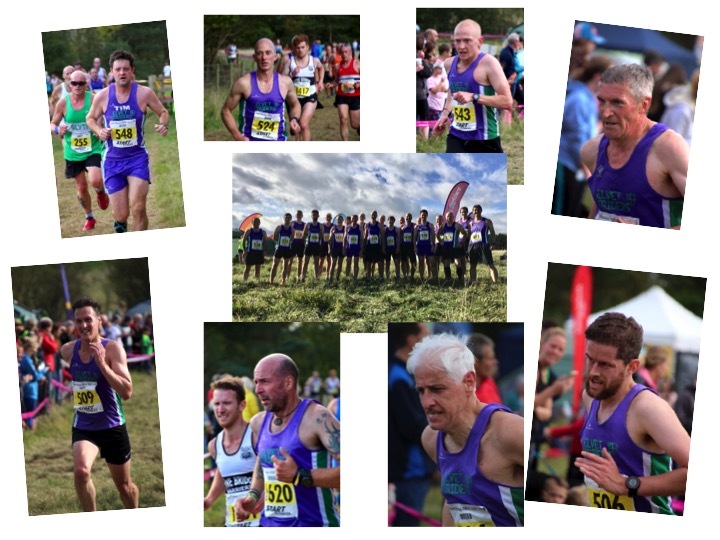 The men’s team put in a brilliant performance to finish in third place on the day and an incredible third place for the season so far – just one point behind the second place club and just two behind the leader! This is our best start to the season for many a long year. Wouldn’t it be great if we were one of the two clubs to be promoted to Division 1 in this our 30th anniversary year?! It’s in our own hands – we need our runners to commit to turning out for the final three fixtures and running their hearts out – come on, let’s go to it! Saturday 28th Nov dawns dry. But the weather forecast suggests rain and strong wind but maybe not in the sliver of Northumberland where Druridge Bay lies. 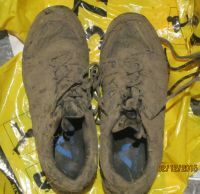 This was to be my second ever cross country. But with a confident step I made my way to the bus pick up. The weather seemed to be holding up as we arrived at Druridge Bay and made (plodged) our way to the tent encampment. 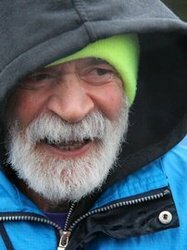 Things were not looking good with people in purple fighting to erect a tent which wanted to fly across the North Sea to Scandinavia. 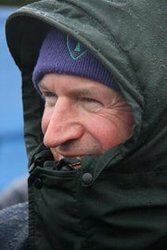 In the end defeat was acknowledged and the prospect of changing in the now near gale winds and rain in the open looked likely. But behold it wasn’t the Strider tent. This had been erected earlier by our two tent professionals Susan and Geoff next to this errant one. Phew!!! 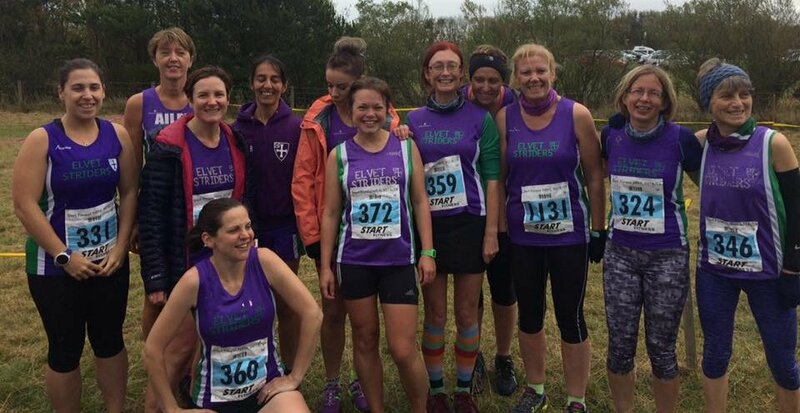 So with as many clothes on as possible and the women huddled in the tent we waited the start of the senior races. Having cheered on the women’s competitors and taking note of the reports they reported back from the front of the mud and warm running conditions we reported to the start and after a rather chaotic beginning settled into the race. Having started near the back I made forward progress by sliding, squelching, sinking, splodging, slurping through the many stretches of muddy gloop. But I managed to pass a number who were even slower than me. Then on the last lap I saw Adam Bent ahead of me and to my surprise I was closing on him. As I got up to him I cheekily suggested we should finish together but somehow he found something extra and I couldn’t so I watched him disappear ahead of me. Maybe next time. 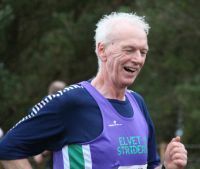 I did however pick up my pace in the finishing straight with a rare burst of speed ( well humour never goes amiss) when voices told me another Strider was after me. Oh stupid pride thou willst be the death of me!! 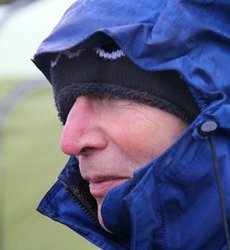 Then it was back to the bosom of the tent, cake of all descriptions and changing on a wet field. I declined changing in the tent since there was a danger in my exhausted state of falling over and drowning in the lake inside the tent. Back to the bus with a well prepared driver already with clean plastic bags to put our shoes in and a relaxed drive home. So did I enjoy the race? 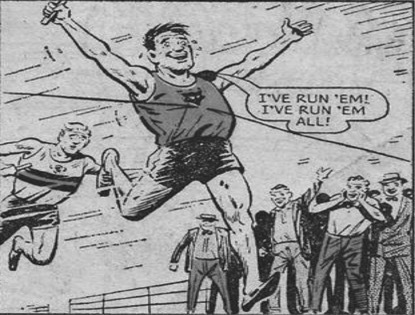 I must admit enjoyment is not a word I would use but I am glad I did it and now roll on the Town Moor. But after that I must remember not to put my smartphone in my rucksack and then put the rucksack and phone in the washing machine. Did I mention it was an expensive experience?